The Centers for Disease Control (CDC) finds that 1 in every 3 Americans is obese or overweight. Obesity contributes to major diseases including diabetes, heart disease, and high blood pressure. 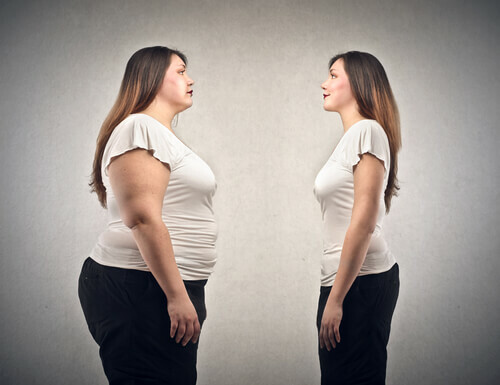 Excess body fat is also a leading factor in developing varicose veins. Obesity puts extra pressure on the leg veins and their valves. This makes it harder to pump blood against gravity back to the heart. Effective valves in the leg veins are important because they prevent blood from flowing backwards and pooling in the legs. Over time the added stress of extra body weight can cause the valves to fail. The resulting back pressure can cause the vein branches to expand and become varicose veins. Diet, exercise, and lifestyle changes are important keys to losing weight. This can then help to prevent varicose veins as well as other disease. Leading a sedentary lifestyle further contributes to the formation of varicose veins. Standing for long periods of time, especially when overweight, can also lead to varicose veins. General health is improved and the risk of varicose veins is diminished when you move around and walk as much as possible. Sometimes obesity may mask varicose veins because excess fat in the legs hides them. Also, severe obesity often results in venous insufficiency in the deep veins in the legs causing venous ulcerations, which often take many months to heal. For this reason, if you are experiencing symptoms like heavy legs, painful legs, swelling, or skin changes you, you may have venous insufficiency. This can be true even if you don’t visually see varicose veins. You should see a specialist, especially if you notice changes in the skin, such as darkening around the ankles, or chronic swelling. Even if you see mild enlarged veins, it is important to seek diagnosis and treatment if necessary. If you are struggling with obesity and varicose veins, it is important to use all the tools necessary to treat your vein problems. Resources include dietary improvements and increased exercise as well as wound care, compression therapy, radiofrequency ablation, and sometimes even endovascular surgery. A vein specialist can use a simple ultrasound to tell you if you are suffering from venous insufficiency and help start you with a personal plan to control symptoms and improve your enjoyment of life.